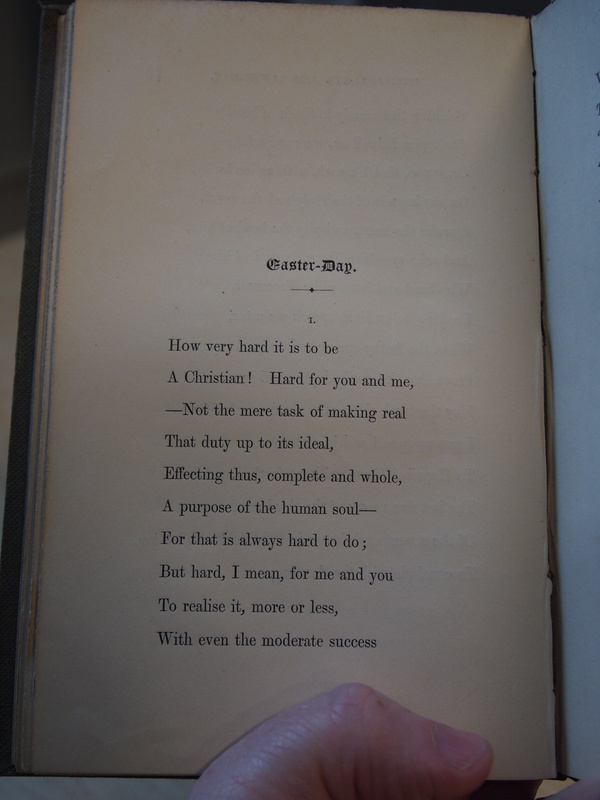 Please note that Rare Books and Special Collections, the Chung Collection and University Archives will be closed on Good Friday and Easter Monday; however, we are open as usual on Saturday the 30th, from 12-5. Please check the Library’s Hours and Locations portal to see hours for other branches over Easter weekend. This work was the first Browning published after his marriage to Elizabeth Barrett. It was published by Chapman & Hall in 1850. 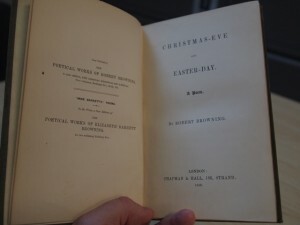 The two sections, Christmas-Eve and Easter-Day are often referred to as separate, but were published together in this one volume. 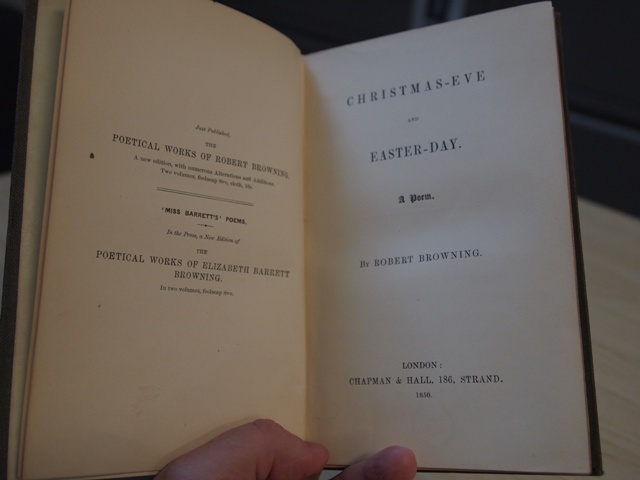 To see what other works by Robert Browning, or Elizabeth Barrett Browning, we have in RBSC, you can search the library catalogue. 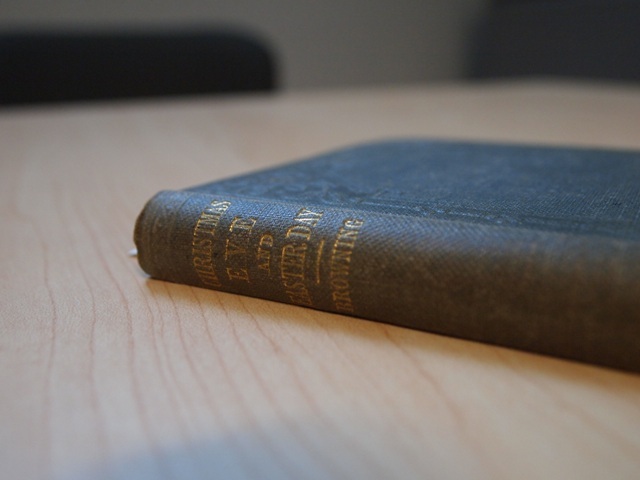 If you are interested in the Colbeck Collection, the catalogue A Bookman’s Catalogue is available both in print and online. Due to a software upgrade to our Automated Storage and Retrieval System many of our archival collections and some of our book collections will be unavailable to request during the week of March 25th. We anticipate the system being fully functional again by Tuesday April 2. Our sincere apologies for this continue inconvenience. In this post in our series of B.C. places used as room names in the Irving K. Barber Learning Centre, we are going to feature Trail, B.C. We are also going to talk about archival appraisal, but first- a little bit about Trail! This photograph is found in the W.G. Burch fonds. Gerry Burch, as he is known, is a retired forester who grew up in Trail, and who donated his archival material to Rare Books and Special Collections, because he knows that our researchers are very interested in forest history (you can read more about our forestry history holdings through our Forestry History Research Guide). So what, you may be wondering, does this hockey team have to do with forestry history? Why is this photograph kept as part of the collection? This is when a decision of archival appraisal is made. Unlike monetary appraisal, archival appraisal is a decision made to determine what is kept, and not kept, for long term preservation in an archival institution. Society simply creates too much documentation to preserve it all- it is an important part of an archivist’s role to make appraise archival material for what we call “retention”. There are a lot of viewpoints that an archivist can use to make appraisal decisions, but generally, we archivists are looking for evidential or informational value in the records selected for preservation. In the example of the W.G. Burch fonds, the documents in the fonds that he generated during his career as a forester provide evidential value about forestry practices in B.C., and his activities more specifically. 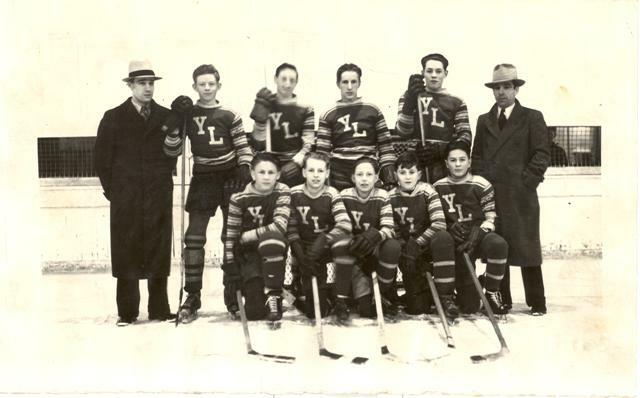 In the case of this hockey photograph, taken during Gerry’s youth (he’s in the back row on the far right) it provides informational value about the history of a B.C. town- in this case, Trail. Another factor that archivists would consider is the value in keeping the archives of a person or an organization together- we try our best to avoid “splitting a fonds” between archival institutions because the best way to understand a person’s life and work is to have the context of their archives remain intact. In the Barber Centre, the Trail Meeting Room is room 491, which is part of the iSchool at UBC (the School of Library, Archival and Information Studies). iSchool students in the Masters of Archival Studies program learn about appraisal in ARST 520: Selection and Acquisition of Archival Documents.